Dr Nasser Hambaz has over 30 years family care experience treating patients of all ages with the utmost care. He completed is residency in Buffalo, New York and is actively involved in training and up-to-date medical advances on a weekly basis. He ensures he and his staff are highly certified and at the forefront of medical knowledge ensuring quality healthcare is provided for every patient. 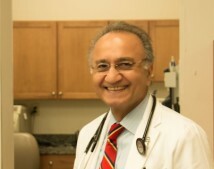 He is also associated with the Virginia Medical School and has been accepting medical school students to practice alongside him in a professional learning environment for the last 20 years. Probably one of the best doctors I’ve been to. They were friendly and knowledgeable. They care for what the patient wants, not what they think is good for you. I’d definitely recommend First Choice Medical Care. Phil E.